Some might challenge the accuracy of that statement but few would debate the urgency of Haiti’s ongoing dire conditions. At this point, the primary push in the country is to recover not only from the earthquake of 2010, but as U.N. General Secretary Ki-Moon noted, from the cholera epidemic which followed and claimed another 3,300 lives. Moreover, hurricane Tomas took its toll on the island-nation as well. Aside for the actual loss of lives, more than a million people in the capital of Port-au-Prince were displaced and they still are. That number represents approximately one third of the city’s pre-earthquake population. Hatian musician Wyclef Jean makes urgent appeal on behalf of his homeland. 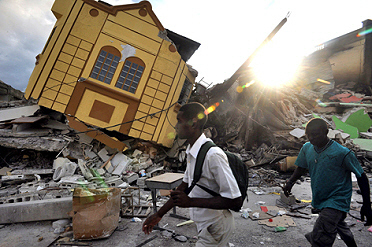 The incredible world-destroying 7.0 earthquake that erased life as Haiti knew it January 12, 2010, has taken more lives than anyone is either able, prepared, or willing to count. It is the kind of horror that even the most masterful psychotronic film classic could never hope, or even want, to match. They/we become prone to questioning the sense behind believing in notions of a loving God or in the belief that life possesses any kind of innate sanctity or meaning invested with spiritual integrity at all. The Global Village’s Olympian response to the devastation in Haiti is one major possible answer to the painful question of “Why?” The Red Cross Rescue teams, doctors, nurses, potential adoptive parents, security personnel, engineers, ministers, diplomats, and well-intended contributors from across the planet made their way to the traumatized nation as soon as conditions allowed. The aftermath remains perilous as smaller earthquakes continue to rock the region and the battered psyches of survivors. The fierce urgency of this moment is as much about Humanity’s need to transform ideas regarding love and compassion into acts of love and compassion as it is about demonstrating the ability to overcome cultural and racial differences for the sake of unify in times of crisis. It is as much about the need to make concepts of what Human Beings refer to as the nobility of the Human Soul into a functional reality as it is about preserving the battered bodies of a country’s challenged sanity. That’s why every life-saving response to this brutal hour –and those that arise in the future– is as crucial for the providers of hope and relief as it is for the recipients of the same.